Last night we flew to Mashad, Iran's holiest city. The name means, "Place of Martyrdom." 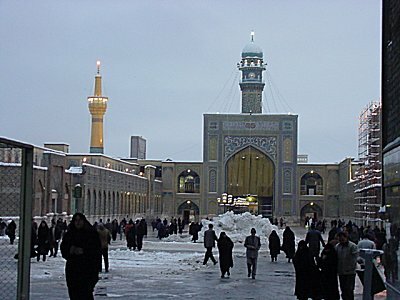 It serves as the home to the mausoleum of eigth imam and direct descendant of Mohammad, Emam Reza, who died in 817 AD. 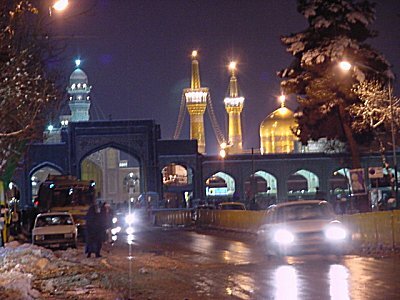 The city grew up around the legend of Reza; he became the eigth imam when his father, the seventh imam, died in a Baghdad prison at the hands of the Caliph, Harun al Rashid, of 1001 Arabian Nights fame. The Caliphs are the successors of Mohammad according to the Sunnis while the imams are the successors according to the Shiites. Most imams died at the hands of Sunni caliphs and Emam Reza fell into this fate as well. 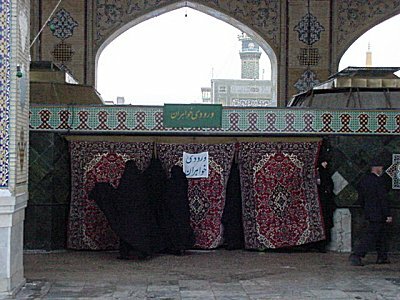 Harun al Rashid's son murdered Emam Reza and buried him at the site that founded the city of Mashhad. Centuries later, when the early Safavid rulers declared Shiism to be the state creed, Mashhad blossomed into the major pilgrimmage site of Iran, second only to Mecca in importance. One of the holiest sites in Iran, the mausoleum of Emam Reza in Mashad. The shrine forms a walled island enclave in the city center. Inside the walls stand mosques, museums, colleges, courtyards, libraries, offices, and a post office. The colorful tilework uses colors and design patterns more than any other mosque we've seen. Go through these carpets and become a 'mashti.' A pilgrimage here is one of the most important acts of faith for a Shiite Muslim. In the same way as a pilgrim to Mecca may use the term haji forever after, a pilgrim to Mashad may use the term mashti as a name prefix. 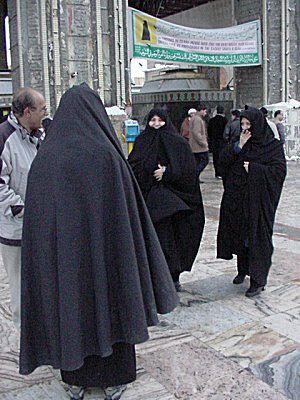 Women are happy to show Jill how to wear a chador, a full length veil, it's good entertainment for them. Mashad's Holy Shrine, topped by a dome and two minarets that are made from gold bricks.